Through his vibrant colors, playful themes and hard-edged compositions, Romero Britto captures the attention of both youthful spirits and educated art collectors. It is the unique talent which has established Britto’s reputation and granted him a significant presence in the US, Europe, and Asia. In a multitude of media, Britto’s art contains endless themes and images, portraying small personal stories of life experiences. 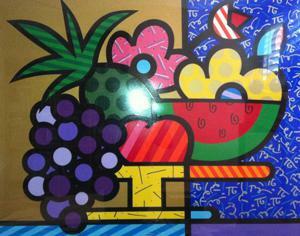 Easily recognized, Britto’s work is unmistakably modern, bold, and colorful. His style often combines the artistic techniques of Pop Art with the intricatd qualities of Cubism. 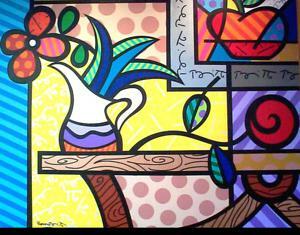 In an effort to bring his work to the masses, Britto’s work is constantly changing and challenging the meaning of art. The natural inclination for Britto to express himself visually became the apparent to those around him at a very young age. He often painted images from his active imagination on scraps of cardboard and newspapers in his hometown of Recife, Brazil. In 1987, Britto traveled to the United States to challenge his talents among other Pop Art heavyweights. Since then, he has gained entrance to art exhibitions such as FIAC Paris, Art Salon Hong Kong, and numerous world tours. His work had captivated corporate collectors like Pepsi Cola International and ABSOLUT Vodka. 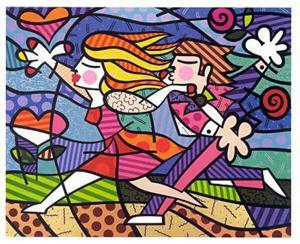 To date, Romero Britto continues to fulfill his dreams with an inexhaustible momentum. Britto maintains that “Art is too important not to share.” He often dedicates his time and talent to worthwhile international organizations, such as St. Jude’s, the American Red Cross, and Best Buddies. His paintings grace the collections of heads of state, European nobility, and superstars of the athletic, entertainment, and business worlds. 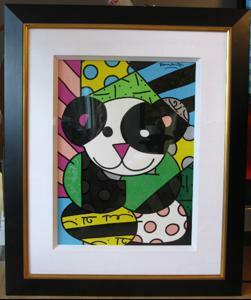 In addition, over a hundred galleries throughout the world proudly represent Romero Britto’s art.